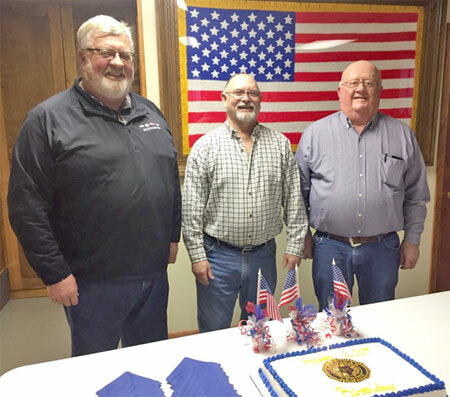 The Ohiowa American Legion Auxiliary hosted a birthday supper on March 19, to celebrate the American Legion’s 100th Birthday. Approximately 25 members of the Ohiowa Legion, Auxiliary and Sons of the American Legion attended the celebration. The American Legion was chartered by Congress on September 16, 1919, as a patriotic veterans organization after a group of war-weary veterans of World War I met in Paris March 15-17. Today, membership stands at over 2 million in over 13,000 Posts worldwide. The Posts are organized into 55 Departments--one for the 50 states, along with the District of Columbia, Puerto Rico, France, Mexico and the Philippines. The American Legion Family consists of the American Legion, The American Legion Auxiliary, the Sons of the American Legion and the American Legion Riders. The Ohiowa Franklin Post No. 193 was chartered on August 10, 1920, and was named for the township where Ohiowa is located. The Franklin Auxiliary Unit No. 193 was chartered on May 14, 1927, and the Franklin Sons of the American Legion Squadron was chartered in 1986. Recognized for their years of membership for the Legion were Steve Ozenbaugh, 45 years; Richard Schoenholz, 40 years; Michael Mohr, 10 years; and Wayne Aude and Bill Hanson, five years. For the Auxiliary were Patty Miller, 20 years; Marie Ortgies, 15 years; and Megan Bulin, five years. In the SAL, Richard Meyer, 20 years; John Anderson, 15 years; and Lyle Bartels, Chris Dunker, Nolan Ortgies and Holden Wolfteich, 10 years.